Mobile configuration with Illuminator shown in image above. The pioneering Enforcer Camera offers you absolutely precise accuracy of optical time-of-flight sensing technology which records and capture traffic violations with photos of the real time. 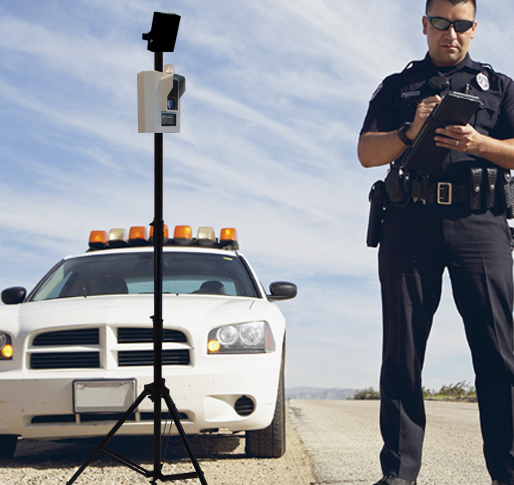 It the first-ever fully integrated 2D multi-beam infrared speed enforcement camera as well as a 16 channel light sensor. With the best vehicle tracking technology, it basically identifies the speed of multiple vehicles while remaining undetectable to laser or radar detectors. All the data collected is automatically transmitted to the Cloud. Install the unique and 2D infrared speed camera to a fixed location with our very flexible, useful and user-friendly mounting system. The Data is automatically transmitted to the EL Cloud and the best part is it can be accessed anywhere with the help of internet. Data is very simple to export and gives you the ability to ticket violators by mail. It is ideally used on highways or main roads. Mount your EL camera on a portable trailer unit for weeks at a time. Send infractions remotely via the cloud and access them from anywhere. Trailer mounted cameras can work 24/7 with illuminator installed up to 7 days under normal conditions. Without illuminator, camera will operate 12-16 days under normal conditions. Ideal for portable, semi long-term use.